Back and seat insert pad cushion sets. Two-part insert pad sets for additional sitting comfort. The blue back and seat inlay cushions in are available for all Boris Shower/Commode Chair sizes with the standard "A" commode opening. 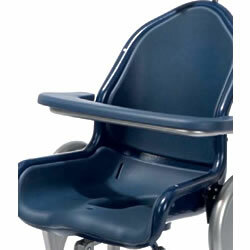 Insert pads adapted for commode opening "B" are available via special order, call for details. Easy to clean.